Some of the characters I grew up with that preceded me have fallen into obscurity but never really went away. There are kids growing up who never heard of Mighty Mouse despite numerous animation studios having done their take on the character. 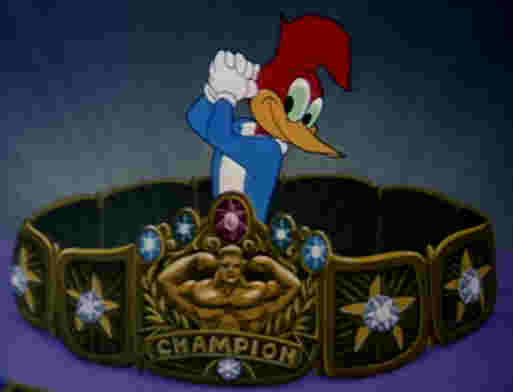 Also on that list is Woody Woodpecker. Created by Walter Lantz after one messed up his honeymoon cabin but his wife Gracie suggested he make the bird an antagonist in one of his cartoons rather than shoot the bird. (That’s according to his press agent and Wikipedia, so question the source.) What started as a one-shot in an Andy Panda cartoon became Lantz’s most famous creation. He’s now owned by Universal, who still uses him as a mascot at their theme parks. There hasn’t been a Woody cartoon since Fox’s The New Woody Woodpecker Show in 1999, which I didn’t care for but it was more a taste issue than a quality issue. Then there’s that recent live-action movie that from what I hear wasn’t very good. Then again, Fox did produce the cartoon based on the first US Godzilla that at least for me redeemed the non-Godzilla so maybe Universal’s new attempt to return the character will redeem the existence of the movie? Universal isn’t going to TV however but YouTube with a brand new series starting next week. To set things up they’ve released a special about the history of the character and a bit about the new series. There have been numerous actors since Blanc’s short stint in the role but for me it’s Gracie Stafford, alias Gracie Lantz, who will define his voice in my head, possibly because it’s her rendition I saw most often plus I like that period of the character the best. My favorites include the one where a stolen formula ends up in his medicine cabinet that gives him superstrength, the one where he gets scammed (and features the recurring line “If Woody had gone right to the police, this would never have happened), and the one where he fights alien termites. He had some great foils like Buzz Buzzard, Gabby Gator, and Mrs. Meaney, while Wally is usually just the poor sap that ends up being tormented by Woody. I wonder if Gabby will make a return? I see Spinter, Knothead, and Winnie are making a comeback as well as Buzz and Wally. If you want to see the new incarnation, as well as many classic Woody cartoons, head over the official YouTube channel and subscribe. Of course I’ll have a review when it does. There’s also a separate channel with classic cartoons featuring another Lantz character, Chilly Willy the penguin. He was created by Paul Smith and developed by Tex Avery, and is the other famous character from Walter Lantz’s studio. Poor Andy Pandy. He never did catch on even when they tried to age him up. Posted by ShadowWing Tronix on November 28, 2018 in Animation Spotlight, Internet Spotlight, Movie Spotlight, Television Spotlight and tagged Universal Studios, Walter Lantz, Woody Woodpecker, YouTube. Woody Woodpecker and Mighty Mouse are so much better than any of these modern kids’ cartoons (ex; Sponge Bob). It’s good news to hear that Woody Woodpecker is making a return.